Awesome weekend with awesome weather! 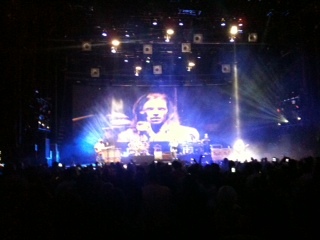 After work J and I went to see Incubus with my brother and his girlfriend. We had so much fun! What a great show. I finally got to see them and they did not disappoint. Brandon Boyd even took his shirt off for me! We got to sleep in and have a lazy morning followed by some shopping and an early dinner on the patio at one of our favorite spots, Escalantes. The only bad part of the day was that I accidentally left my all-time, favorite necklace ever in a dressing room at Dillard's. By the time I realized I didn't have it about 30 minutes later, it was GONE! I'm still upset. I've already looked on anthropologie.com and ebay for a replacement. Nothing. Girls day with my mom!!! These are the best and we had a blast. Lunch at Black Walnut Cafe followed by some shopping. Perfect day. And the Texans won so Jason was in a good mood!